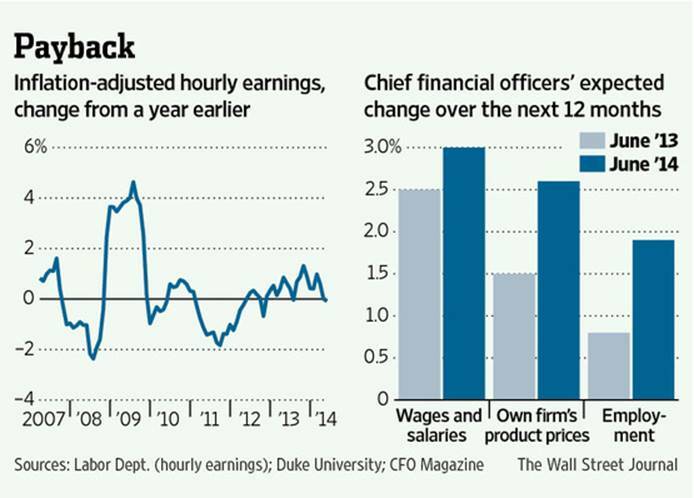 Even as the U.S. job market has improved, companies have been slow to pay workers more. But they may now be approaching the time when they have to cut bigger paychecks to compete. What’s more, they appear to be getting ready for this. The unemployment rate has been falling swiftly, dropping to 6.3% in May from 7.5% a year earlier. But there’s an open question about how much slack there is in the job market. Some 37.2% of the working-age population is out of the labor force now, compared with 34% when the recession started in 2007. And while some of those people lost to the labor pool will likely return, some, such as those nearing retirement age and those whose skills have eroded, may never come back. At Wednesday’s news conference following the Federal Reserve’s two-day policy meeting this week, Chairwoman Janet Yellen indicated that for her, an important sign the labor market is tightening will be when wages are increasing more rapidly. So far, that hasn’t been happening. Average hourly earnings were up just 2.1% in May versus a year earlier, and the Labor Department on Tuesday reported that, when adjusted for inflation, they were actually a shade lower. But companies think they will soon be paying more. This month, a quarterly survey conducted by Duke University and CFO Magazine showed that U.S. chief financial officers expect wages and salaries at their companies to increase 3% over the next 12 months. Last June, they had expected year-ahead gains of 2.5%. Further, they now expect their workforces to increase 1.9% versus 0.8% a year ago. That leaves the little matter of how companies will pay for those bigger, more expensive workforces. Cutting costs elsewhere probably isn’t much of an option after more than six years of following that playbook. Nor, given the muted spending on technology and other capital equipment in recent years, will it be easy to boost productivity and get more work out of employees. U.S. firms have been working existing employees pretty hard already, and new employees will need some time on the job to get up to speed. So companies can let profit margins erode, or they can raise prices. They would prefer the latter: The CFOs said they expect the prices their firms charge customers to increase 2.6% over the next year, against the 1.5% gain they forecast last June. Indeed, recent readings showing prices picking up a bit might be an indication that companies are raising prices in an effort to get out in front of a tightening labor market. If so, inflation might be about to heat up faster than the Fed is prepared for, assuming companies are able to make any price increases stick. Even before the recession, that was often difficult. Now, with many consumers keeping closer watch over their finances, it is probably even harder. At the least, they may wait until they have actually seen those wage gains come through before they countenance paying higher prices for goods and services. Perhaps more inflation really is coming. But lower profit margins are probably coming first.